The land on which “Marthaville” stands is part of the grant made to Henry Bell. At the beginning of 1900 the local blacksmith Thomas Lanfranchi purchased the land from Elizabeth Bell and Alfred Tertius Holdsworth. By 1916 a house, shop (possibly where Lanfranchi carried out his work) and a garage had been built, and by 1925 the house was known as “Marthaville”. After Thomas Lanfranchi died the property remained part of his estate for several years until it passed to Francis Charles Lanfranchi, who belonged to the RAAF, during 1945 or the first third of 1946. At the end of 1946 he sold the property to a local carrier, Norman Field, and in November 1952 the title to it was expanded to include his wife Martha. The Fields may have tenanted the property before purchasing it, as it has been claimed that the house was named after Martha Field. By 1972 Norman Field had died and the property passed to his widow Martha, who sold it in May 1972 to a Blackheath truckdriver, Gordon Commens. He sold it in turn to Wesley Noffs and Amanda Rodic in the middle of 1973. The couple later married, then in 1980 sold “Marthaville” to local carpenter Cecil Mills and his wife Pauline. By the beginning of 1984 the house and land had become the property of Russell Taylor. 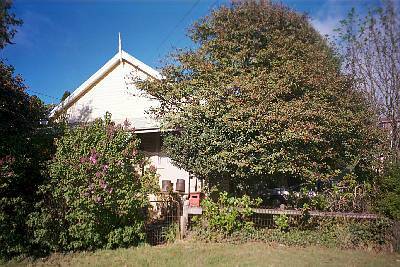 Marthaville is a gabled house in Federation carpenter vernacular style with a bullnose verandah at the gabled end facing east to Great Western highway. The house is set below the embankment at the rear (west). It is a single storey cottage with a gabled roof and a verandah with a bullnosed roof on its western side (below one gable). Its roof is covered with corrugated iron, while the gables have simple barge boards and turned timber finials. The walls of the cottage are lined externally with rusticated timber weatherboards. The verandah roof is supported off turned timber posts with fretted brackets. Windows generally consist of timber framed double hung sashes divided into two panes by vertical glazing bars. Windows on the northern side of the house are shaded by corrugated iron canopies supported off timber brackets. There is evidence of dairy farming activity elsewhere on the site, including a corrugated steel cow bail next to a stone wall in one of the paddocks to the south of the house.